My Doctor asked for my Anti-Aging Secrets. Here they are! Yesterday, I visited the doctor for a first time in a while. This was just a routine wellness checkup. This year I turned 40 and I realize that I have to take precautions to protect my body against age-related diseases. After completing my intake form and first-time visitor information, the nurse took me to a room to await the doctor. A few minute later, the physician walked in. My first impression of her was that she was younger than expected. Maybe in her mid 30's. When she looked at me, she seemed a bit surprised. After confirming my name, the first words she said to me were "You don't look 40! What are you doing to look like that? You look like you're 30!" I smiled graciously at her comment then told her that I write about beauty and anti-aging topics. But since time was limited, I couldn't go into detail about what I think is contributing to my healthy appearance. Since I'll probably go back to see her again in the future, I thought I'd write the post to refer her to. Before I talk about the specifics, I want to fill you in on my anti-aging philosophy. Essentially, I study the qualities I see in young skin versus people with mature skin. Then I try to replicate the "younger skin characteristics" in my own routine. Next, I differentiate the qualities between people in their 40's who look good for their age, versus people in their 40's who look younger than their age. There is a clear difference. 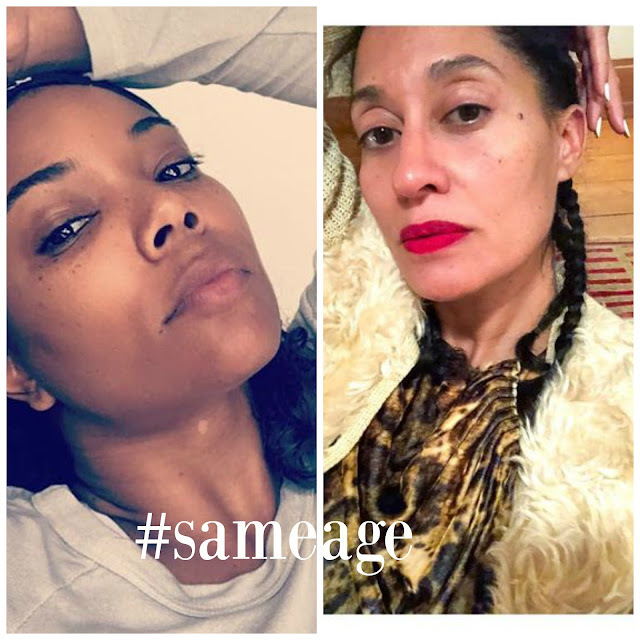 Tracee Ellis Ross and Gabrielle Union are the same age (45) and share the same birthday. Tracee looks good, Gabrielle looks younger. Jennifer Aniston and Gwen Stefani are the same age. Jennifer looks good for her age. Gwen looks much younger than 48. In the examples above, all the women are beautiful but two of them appear younger looking than their actual age. We have to ask ourselves, why do Gabrielle and Gwen look younger than their counterparts? I'm sure genetics has a lot to do with it. But instead of simply dismissing the question with a one-word answer (genetics), I start to pay attention to what makes them look young? In my mind, both Gabrielle and Gwen have what I call "qualities of youth." The first, and most important, quality of youth is the appearance of the skin. I've mentioned before that after studying the faces of hundreds of people (while sitting at airports), I've come to realize that the biggest difference between young and older looking skin is the appearance of health that is the result of increased blood flow. Young skin looks "backlit" Older skin appears dull and two-dimensional. I noticed that babies and toddlers have the most healthy looking skin. This continues into our twenties then the look of our skin starts to decline. In my beauty routine, I try to recreate the appearance of "backlit skin." I do this by stimulating the skin via facial massage, ice facials, using my led mask. The goal is to get the blood flowing to the face. Ever use a Snapchat filter? You might have noticed that they blur out imperfections on the face. The resulting image pretty flawless. I noticed that if I took a pic of myself with & without the filter, I appeared younger looking in the filtered pic. Why? Because completely flawless skin is a quality of youth. Once I made the connection, I tailored my skin routine and makeup application to mirror the results of these filters. I'll be exploring how to create perfectly flawless (filter-like) skin more in 2018. Another HUGE quality of youth is facial volume. One main difference between the doctor and myself is that he had very little facial fat. I immediately prescribed her a diet high in collagen. This is probably my secret weapon in preserving youth. I have collagen in all forms. I have collagen pills, the powder, and even bone broth collagen. Not a day goes by where I don't consume it. I'll never forget reading an account online where the person said that they watched a news story where a bunch of a doctor's patients were interviewed for an expose. One thing the person noticed that all of the patients seemed to have young, healthy-looking skin. This doctor recommended his patients take collagen and they all experienced improved skin as a result. My doctor asked if I did botox. I told her no, then did a few facial expressions to display the faint lines on my forehead. The lines exist, but my goal is to have a resting face free of lines and wrinkles. In my opinion, collagen helps tremendously. When a person enters her later 30's, 40's and beyond, her face begins to sag. This is a result of weak muscles or muscle loss. My biggest ally against sagging muscles is microcurrent. Lately, I've been using my micro current rollers while wearing a sheet mask to supercharge the results. Shhhh...don't tell nobody. The next factor of youth is barely talked about. And that is our bone structure. Simply put, our facial bones change as we age. This is why you'll see a woman with no wrinkles still have the look of maturity. She has the bone structure of an older person. No matter how great your skin looks, if your bones become thinner, you'll start to look like an older version of yourself. We don't have much control over our bone facial bone density but I have studied a little bit about bones and have to come to this conclusion. Bones respond positively to direct stimulation. One of the reasons I love rebounding so much. It's powerful bone-strengthening effects. I remember watching a video on Youtube once where the woman, who was suffering from osteoporosis, claimed to have experienced a measurable increase in bone density thanks to a regular rebounding routine. I don't know about you but this information is exciting. We know that our bones respond positively to vibration and stimulating. When I massage my face, I apply a little pressure to stimulate the facial bones. They're even starting to use electrical stimulation (microcurrent) to help shorten the healing time of people with bone fractures. Perhaps my microcurrent sessions are helping to preserve the thickness of my facial bones thereby helping me to look younger, longer. Basically, I follow a holistic strategy to looking younger with a focus on enhancing/maintaining the qualities of youth. There are other obvious rules that I didn't mention like drinking loads of water, detoxing regularly, and supplementing with vitamins that are abundant in younger skin like silica, hyaluronic acid, etc. Those are my fundamentals for looking and feeling your best at any age.